Brittany has provided her review of her favorite glass and window cleaner, called Professional Strength glass cleaner. I'm all about saving money, so I usually go for the store brand products. Sometimes the name brand is a lot better than the cheaper brands, but that's not the case for this one. 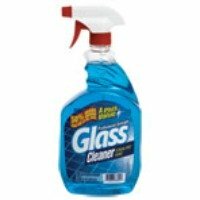 I got Professional Strength Glass Cleaner from a Dollar Tree for one dollar plus some tax. I'm not sure if it's available anywhere else for cheaper, but I'm happy with paying a dollar for it, especially since it works. It smells like basically any other glass cleaner I've used. I think maybe it smells a little stronger than most, but maybe I have a sensitive nose. As far as I can tell, it doesn't leave any streaks. I use newspaper to wipe down my windows though, which is supposed to help with streaking, so I'm not sure how it does with paper towels or a rag. The windows I clean never get really dirty, but it seems to work just fine on normal types of indoor windows. I've also cleaned off my car windows with it before and had to change the newspaper several times, but that might be a dirt issue and not really an issue with the product itself. Really, in conclusion, it seems like a value for how much you get for how little it costs. Thanks Brittany for your review of Professional Strength glass cleaner. I think you make a really good point about store brand versions of cleaning products. Many times, especially for some simple cleaning products like glass and window cleaner, store brands and generics work just as well as name brands, but cost less. This is also true of things like baking soda and chlorine bleach. The generic version are chemically identical to the name brands, but cost less. It is always great to save money! Remember, you can also save money on your cleaning by making your own homemade cleaning products (click the link to find some great recipes you can make). So, does anyone else want to tell me about their favorite window cleaner? If so, you can share your glass and window cleaner reviews here, or read others reviews already submitted.